Maya Ying Lin was born on October 5, 1959, in Athens, Ohio, a manufacturing and agricultural town seventy-five miles southeast of Columbus. Athens is also the home of Ohio University, where Lin's mother, Julia Chang Lin, a poet, was a literature professor. Her late father, Henry Huan Lin, was a ceramicist (a person with expertise in ceramics). The couple came to America from China in the 1940s, leaving behind a prominent family that had included a well-known lawyer and an architect. Lin's family in America includes her mother and an older brother, Tan, who, is a poet like his mother. During her childhood, Maya Lin found it easy to keep herself entertained, whether by reading or by building miniature towns. Maya loved to hike and bird watch as a child. She also enjoyed reading and working in her father's ceramics studio. From an early age she excelled in mathematics, which led her toward a career in architecture. While in high school Lin took college level courses and worked at McDonalds. She considered herself a typical mid-westerner, in that she grew up with little sense of ethnic identity. She admits, however, to having been somewhat "nerdy," since she never dated nor wore make-up and found it enjoyable to be constantly thinking and solving problems. After graduating from high school, Lin enrolled at Yale University in New Haven, Connecticut, to study architecture. Her best-known work, the design for the Vietnam Veterans' Memorial in Washington, D.C., grew out of a class project during her senior year. In 1981 her entry was chosen out of a field of 1,421 unlabelled submissions in a design competition that was open to all Americans, not just professional architects. Lin was just twenty-one years old at the time. In keeping with the competition criteria of sensitivity to the nearby Lincoln Memorial and Washington Monument, the inclusion of the names of all the dead and missing of the war, and the avoidance of political statements about the war, Lin's design was simple. She proposed two two-hundred-foot-long polished black granite walls, which dipped ten feet below grade to meet at an obtuse (greater than 90 degrees) angle of 130 degrees. The two arms were to point towards the Lincoln Memorial and Washington Monument, and they were to be inscribed with the names of the approximately fifty-eight thousand men and women killed or missing in Vietnam. These names were to be listed chronologically, according to the dates killed or reported missing, instead of alphabetically, so that they would read, in Lin's words, "like an epic Greek poem." The memorial was dedicated in November of 1982. After the Vietnam Memorial project, Lin returned to Yale for a master's degree. Her later projects included designs for a Philadelphia, Pennsylvania, stage set; a corporate logo; an outdoor gathering place at Juniata College in Huntington, Pennsylvania; a park near the Charlotte, North Carolina, coliseum; and a ceiling for the Long Island Railroad section of Pennsylvania Station. In addition, her lead and glass sculptures have been exhibited at New York's Sidney Janis Gallery. also bathed in a film of moving water, which serves to involve the viewer sensually through sound, touch, and the sight of his or her reflection, while the words engage the intellect. The two geometric elements of the Civil Rights Memorial are not completely without symbolic meaning. Lin has noted that the asymmetrical, or uneven, cone-shaped table looks different from every angle, a quality which implies equality without sameness—an appropriate view in a memorial to civil rights. Lin says this memorial will be her last, and notes that she began and ended the 1980s with memorial projects. She feels fortunate and satisfied to have had the opportunity. In 1993 Lin created a sculptural landscape work called Groundswell at Ohio State University—a three level garden of crushed green glass. The glass used in the effort reveal Lin's environmentalist nature. Lin remains an active sculptor and architect. In 1997 she began work on a twenty-thousand-square-foot recycling plant. Lin currently lives in Vermont. She stays out of the public eye as much as possible. Still, so much of her work is so public and so creative that publicity is hard to avoid. Maya Lin has published several books and is currently working on different architectural and sculptural projects. Coleman, Jonathan. "First She Looked Inward." Time (November 6, 1989). Hess, Elizabeth. "A Tale of Two Memorials." Art in America (April 1983). Danto, Arthur. "The Vietnam Veterans' Memorial." The Nation, (August 31, 1985). Lin, Maya. Boundaries. New York: Simon and Schuster, 2000. Yokoe, Lynn. 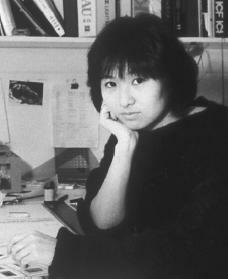 Maya Lin, Architect. Parsippany, NJ: Modern Curriculum Press, 1994. I am doing a report on Maya Lin in my Art 1-2 class.I really love her work, she is a very influencal artist! I agree. I can't wait until my class goes to D.C. Her design for the Vietnam Memorial was simple, yet elegant. Like a Christmas ornament. This is one of the best written pieces I have ever read. I hope many other people read it and learn all about Maya Lin and all of her great works. This helped me on my report, it will help you too. I really like this website. There is a ton of information and it helped me when I had to do a last minute project.